Ideal for fixing door and window frames, timber beams, battens, wooden laths, facades, metal profiles, panels etc into masonry. Suitable for concrete, solid brick, perforated brick, hollow blocks, natural stone etc. 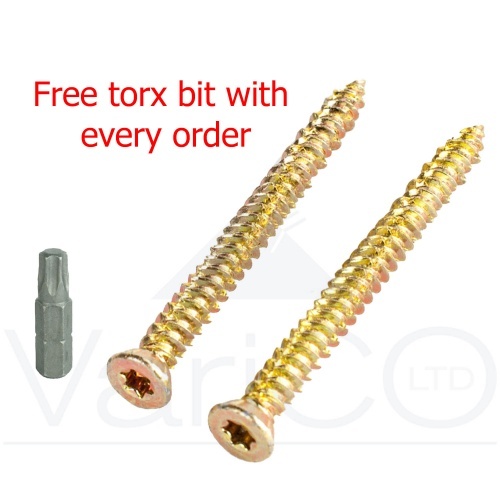 Supplied with a free TX30 Torx bit (one supplied free with every order). White plastic cover caps also available. To use these fixings all you need to do is drill a 6mm pilot hole in your masonary and the screw will tap its own thread. THERE IS NO NEED TO USE PLASTIC PLUGS. Screws have a TX30 T Drive recess to reduce driver wear and prevent camming out. Screws are dispatched same working day if ordered before 1:00PM.